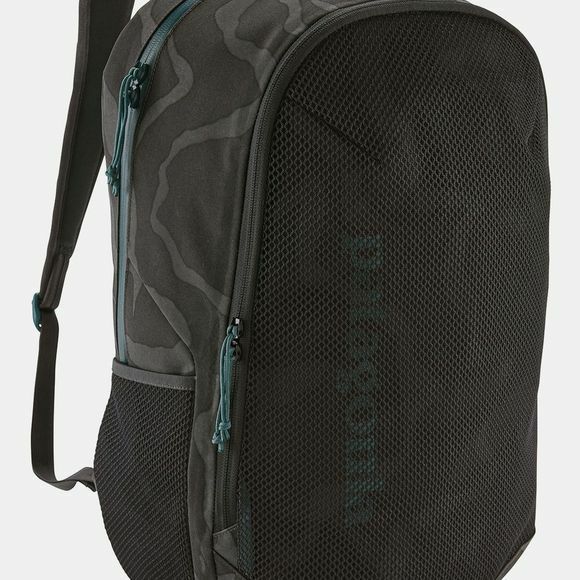 The Planing Divider 30L Backpack from Patagonia is ideal for trips around the town, around the world or around the distant point to approach your favorite break. It safely hauls all the essentials while keeping your wet and dry gear separate. The ideal everyday surf pack, it features a classic panel-loading design for instant access to the items you need whenever you’re around water. The main compartment opens with a burly zipper to hold extra clothes, dry towels and food for the day. Inside, there’s a laptop sleeve (sized to hold most 15" laptops), a zip-closing mesh pocket for your keys and wallet, seam taping to keep water where it belongs and an easily cleaned fabric coating. The front mesh pocket (with drain holes) carries your wet towels and swimsuit and closes with a long zipper to accommodate bulky items. Two exterior mesh pockets hold water bottles or additional wet gear. A breathable and hydrophobic shoulder harness combined with the padded back panel provides all-day carrying comfort. Made of a tough yet limber 300-denier, 100% recycled polyester with a TPU-film laminate and 100% nylon mesh. Padded interior sleeve up to 15"